Last week, we saw a famine strike the whole world, forcing ten of Jacob’s sons to go to Egypt for grain. (Benjamin stayed behind, of course. He was the favorite and Jacob didn’t want to put him in danger.) Unbeknownst to the brothers, their long-lost brother Joseph had ascended the ranks in Egypt and was now head of grain distribution. Thirteen years had passed since the brothers sold Joseph into slavery, and when they stood before him to ask for grain, they didn’t recognize him!But he recognized them. Joseph was overwhelmed at the sight of his brothers, but he wasn’t sure that he could trust them. To test their character, he remained incognito and accused his brothers of spying. He sent them home with grain but he kept Simeon hostage. “Don’t come back without Benjamin,” he said “or I will know that you are spies.” Knowing that their dad would never let Benjamin make the perilous journey to Egypt, the brothers returned home despondent, only to be further discouraged by discovering the money they thought they had used to purchase the grain had been put back in their bags by mistake! If “The Man” in Egypt wasn’t afraid of holding Simeon hostage, how would he react to finding out they took grain without paying for it? In Genesis 43, Jacob’s family runs out of the grain they got from The Man in Egypt, and they are faced with a dilemma: Do we go back to Egypt for more grain and face the wrath of The Man, or do we stay home and starve to death? Surely this dilemma was brought upon them by God as punishment for what they did to Joseph all of those years before! Well, their dilemma wasn’t much of a decision. They had to go back, face their fears, and risk losing Benjamin. 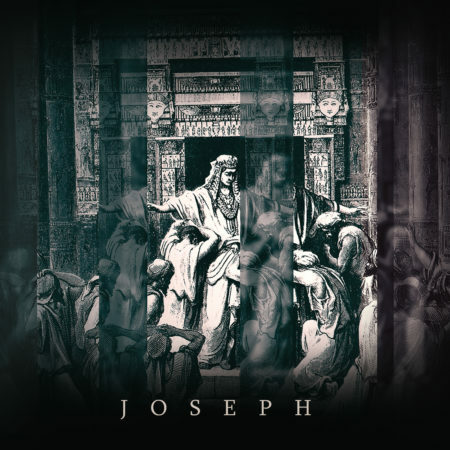 But as we’ve seen throughout the Joseph narrative, there was another side to the story. God was at work. God’s faithfulness during his thirteen years of prison and slavery had taught Joseph to put aside the pain of his past. He didn’t want revenge on his brothers, he wanted reconciliation! Would the brothers recognize him?